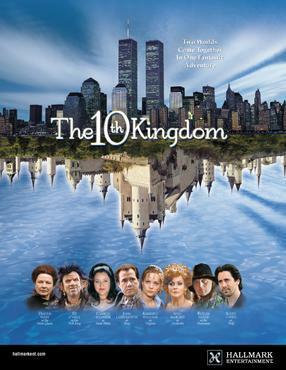 The 10th Kingdom was a mini series about a young woman and her father, who accidentally step through a portal (a magic mirror) to a fairytale world, where everyone didn't live happily ever after. The comedy drama brings in stories like Snow White, Cinderella, Rapunzel, The Big Bad Wolf, etc and is very funny. It originally aired as five two-hour episodes in 2000. Never heard of it but the casting looks interesting. Yeah, it stars Kimberly Williams, Scott Cohen, John Larroquette, Dianne Wiest and Ann-Margret. Sounds like a similar concept to Once Upon A Time, which I've enjoyed. I've seen that listed on the tv schedules, but never watched it. Is it also a comedy drama? No, I have not heard of this one.